The MacBook Pro is not your ordinary type of laptop. In fact, it’s one of those machines you are allowed to refer to using female prepositions. Where is your laptop? I left her at home. Or she is sleeping right now to mean that it’s off. Surely, a device like that needs your utmost care and attention. And considering it costs a fortune too it’s important that you take all the necessary measures to protect it. One of which is fitting it with a case. Accidents happen and in case your Mac Pro slips off the table you at least need to be sure it’s protected because breaking it might probably hurt more than a heartbreak. 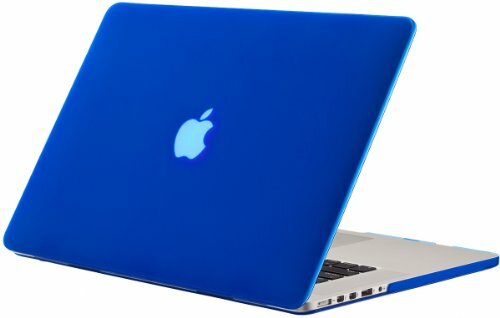 In this post, we are going to highlight the 5 best protective cases you can purchase for your Mac. Whether it’s a MacBook Pro 13 or a MacBook Pro 15, with or without Touch bar you are certain to find a fit for you. This hard exterior shell fits snugly on your MacBook Pro 13 to efficiently protect your machine against scrapes and scratches. The logo has not been cut out but you will still be able to see it through the covers. Visibility varies depending on the chosen colour which can be any of the available 18 colours. Additionally, the case also includes a matching keyboard cover. The Rubberized coating gives the case a smooth yet firm finish for a steady grip so that the laptop does not slip from your hands. The ProCase MacBook Pro 13 Case is basically weightless so that you barely notice it on the Mac it has also been perfectly curved out so that you will be able to access all the external features of your machine without having to remove it. Other features include ventilating rows to avoid overheating and four anti-slip silicone feet to give stability to your MacBook. If you are using the older MacBook models it can be tricky finding the perfect case as manufacturers are focusing more on the newer models. 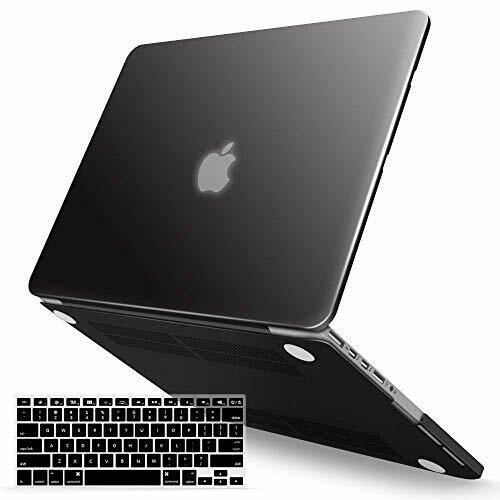 This Kuzy Rubberized case, however, has been specifically designed for the older MacBook Pro 15.4 with Retina Display. It is compatible with all the A1398 models released between 2012-2015. This case fits comfortably on your MacBook Pro and is at the same time flexible enough to allow you to open it all the way. It has been perfectly cut out to give you full access to all the laptop ports and although the Apple logo is completely covered it is still visible through the case. The hard plastic has been given a Rubber paint finish to give it a silky smooth and soft touch that is firm on the hand to avoid slipping. You do not have to worry cooling the laptop thanks to the cooling vents located at the bottom of the case. With almost 20 colour choices to choose from you are guaranteed to find a Kuzy case that matches with your home or office background. And the best part is that it still retains the classy look of your MacBook Pro. This is a case that is designed to not only protect your laptop from dings and scratches but also complement the already elegant MacBook Pro design. And, at only 10 ounces it barely adds any noticeable weight to your Mac. The installation and removal process is quite easy with the case featuring micro clips that hold the laptop firmly onto the case but snap off easily when you want to remove it. On top of the normal cutouts that enable you to access all the Mac ports the case also includes vent cutouts for efficient dispersion of heat. This is further reinforced by 4 rubberized feet that hold the Mac slightly above the ground. If you are looking for something that will not only protect your MacBook Pro 13 but also boost its general appeal then you should definitely try the iBenzer. Mosiso is a household name in the MacBook hard cases which is an assurance by itself that you will be getting top quality protection. 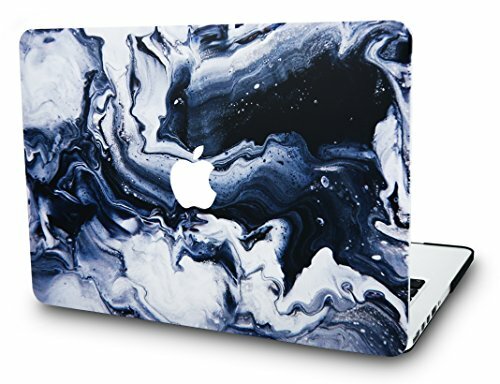 Their MacBook Pro 13 case is only compatible with 2016, 2017 & 2018 models of the Macbook. It weighs a mere 9 ounces and the 1.22mm thickness does not give your machine a bulky look. 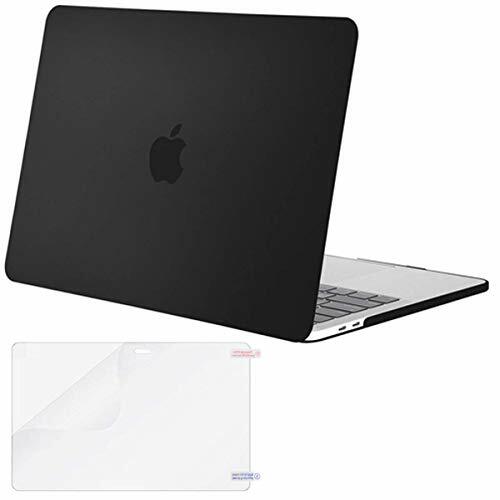 Although this does not place it in a great position to protect your Mac against hard falls it will do a great job preventing scrapes and scratches. All ports are easily accessible without the need of having to remove the case. 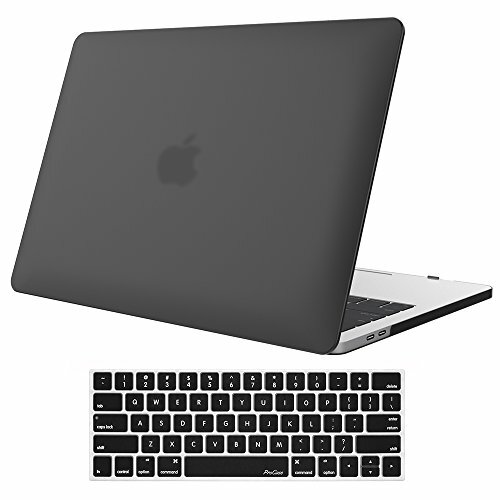 It also features 4 anti-slip silicone feet for stability and to also allow a thin layer of air between your MacBook and your desk that ensures proper ventilation. Another great addition is the screen protector to keep your screen scratch free too. If you are looking for something that is different from the standard colours then the marble design of the KEC case available in white black and black grey is certain to please you. The smooth rubberized finish will ensure that fingerprints, dirt, and smudges are not left on the case and it does not accidentally slip from your hands. All ports have been left uncovered for easy connections without having to remove the case. The four rubberized feet will come will be great in keeping your Mac in a steady position on the tabletop. To top it off, the Apple logo has been cut out and perfectly lines up with your machine for an elegant look. You also get a keyboard cover to match with the cover. The KEC Mac Pro 15.4 inch case cover is really slim and lightweight and will not inconvenience you when carrying your laptop around.